Blogspiration is a wonderful new meme hosted by Sarah at Saz101 and Kristin at Growing Up YA (two of my favourite blogging peoples! Ah, so exciting!). This meme is to help create inspiration among all of us bloggers, readers and writers by posting an inspirational quote, image or video! For more information and to visit other participants please visit this link. This week I picked a picture, that I found on Pinterest (I'm obsessed with Pinterest!). I love Sir Mix-a-Lot's - I Like Big Butts song and I thought this was so true.. Because I like big books and I just can't lie! There is actually a tutorial for this... I may have to do this, I always seem to find myself at the library checking out a billion (well 10..) books with only my arms to carry them. 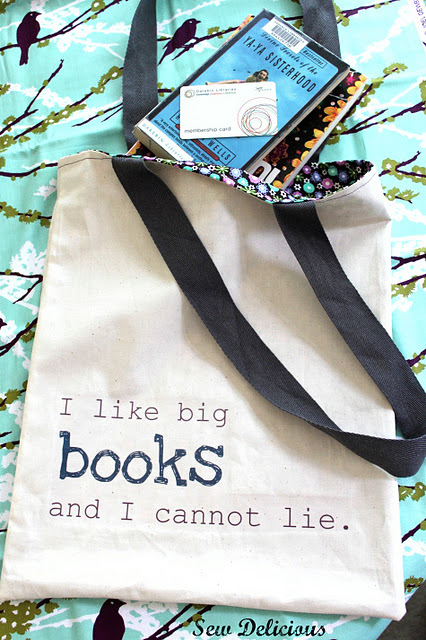 This would be the perfect library bag! The tutorial can be found at Sew Delicious, if your interested! What is your blogspiration? If you did a blogspiration this week leave me links! EEEEE! Amy! Thank you thank you! Kristin deserves all the credit for the meme. She did everything--I just helped with the buttons. Haha that is very handy of him! They have little trolleys and baskets at my library. But everytime I go in there it's only to pick up that one book I have on hold so I don't grab one. Then I end up coming out with 7 or more.. Oopsie. I have only ever had one book become water damaged and the pages got all crinkley and it made me very very sad. I don't have problems with a cat but I do have a dog though I don't seem to have a problem with dog-damaged books! Baskets and trolleys? This is CLEVER. I LOVE Pinterest and I LOVE that bag!! I WANT IT!! That is so cute! I love this bag. Thanks so much for sharing. I want this bag so much... so pretty. New follower. OMG, I want that bag. Thanks for sharing. Old follower. Love that bag also.. Would love to have one.. may have to make it.. thanks for sharing.. If one day I'm feeling creative and determined, I may try to attempt to make one!! They are just so cute! Wow, that bag is awesome!!! I want one too. Love love love your blogspiration!!! Thank you so much for stopping by mine! I heart this! I want this bag! Thanks for sharing!